Pride isn’t just excellent labor history. It’s a reminder of what real solidarity looks like. The trend is undeniable: audiences love watching British workers fight deindustrialization. As reviewers have been quick to note, Pride ’s box office reception follows the unlikely success of Brassed Off , Billy Elliot , and The Full Monty. These comparisons are apt enough, but they miss the important way that Pride flips the genre’s usual sympathies. Although the southern Wales mining community of Onllwyn is central to the story, Pride is told not through the eyes of the miner men or their wives, but from the perspective of gay and lesbian Londoners who collected thousands of pounds to support the yearlong mining strike of 1984–85. Even though the London LGBT community was under attack from police violence and the rapid spread of AIDS, Lesbians and Gays Support the Miners (LGSM) dared to look for political possibility beyond the gay community. The film’s title alone is an indication that Pride is not a standard working-class bootstrapping narrative. It opens far from the picket lines at London’s 1984 Gay Pride march, where rosy-cheeked young white gay men parade in a kaleidoscope of color and upbeat music. One such cherub, Mark Ashton, decides to begin collecting spare change to support the striking miners, thus beginning LGSM and launching a whimsical montage of pals shaking plastic buckets outside gay bars across London. The filmmakers do not explain why the miners are striking, or why Ashton is drawn to their cause, beside his conviction that gay people face the same enemies in police, government, and media. In reality, Ashton and the other LGSM co-founders were all already committed communists and socialists and had been active in left politics before the strike began. These omissions don’t stop Pride from making an emphatic statement about solidarity organizing and the importance of movement culture to political struggle. As the miners and LGSM members get to know one another, speak at each other’s assemblies, and sleep on each other’s couches, the two communities are transformed. Having raised a few hundred pounds, Pride ’s gang of gay men (and one lesbian) gathers at Gay’s the Word bookstore, their headquarters, to decide where exactly the money should go. When they settle on Onllwyn, a striker from the town named Dai Donovan agrees to meet them in London for the first exchange. The goodwill on both sides plays beautifully, with Dai admitting that “you’re the first gays I’ve ever met in my life,” and Ashton sweetly replying that he’s never met a miner. So goes the humor of the film — eschewing countless opportunities to derive humor from gay stereotypes, instead sourcing comedy from the miners’ ignorance of gay culture. The comedic set-up belies how completely the audience is meant to identify with the gay protagonists. Were the film called Labour rather than Pride , opening shots might show an idyllic working-class community awaiting the arrival of strange creatures from another regional and sexual universe. Instead, the drama cuts the other way, with LGSM’s initial arrival in the Onllwyn miner’s hall providing some of the highest tension. How will our scrappy pompadours fare among the models of heterosexual masculinity? Labor histories sometimes trivialize these elements of campaign work, but Pride is a reminder that campaigns thrive off energy of spirit. Righteousness is the vital spark, but endurance is borne of real social connections and deeper fulfillment in the movement culture. This was what I loved about LGSM — on the one hand many of us were serious Trots, but there was no fear of nelly camp . . . I think it allowed that kind of campy, humorous, confident way of campaigning. We knew exactly what pushed the buttons of the gay community. I don’t think a non-gay-only campaign would have had a glamorous fashion show and jumble sale. 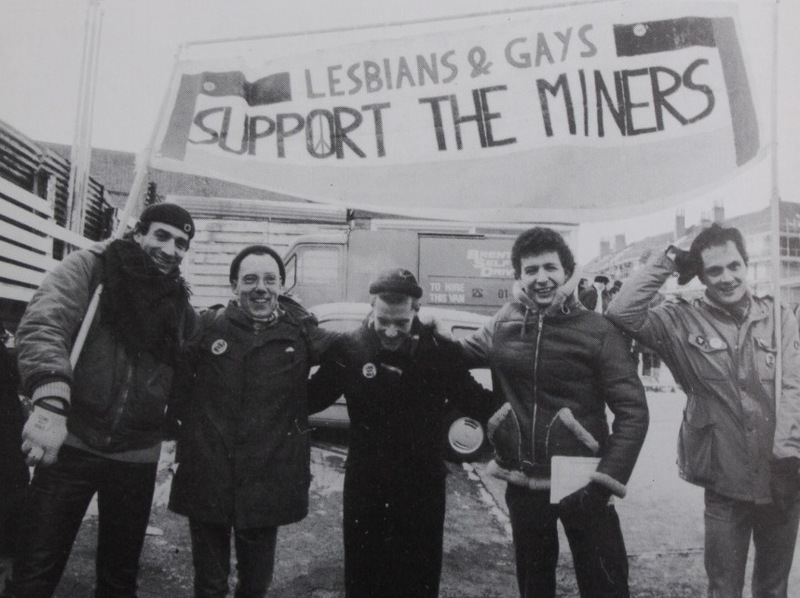 LGSM didn’t shy away from gay culture, instead mobilizing it to draw solidarity and funds for the striking miners. 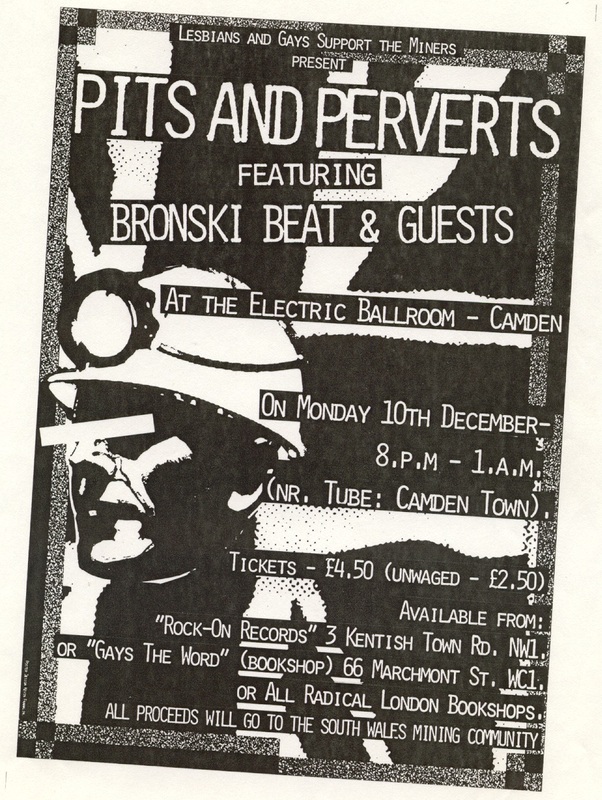 Most famously, the group organized a “Pits and Perverts” benefit concert, headlined by the openly gay pop group Bronski Beat. Along the way, Pride mercifully avoids overly simplifying the internal dynamics of either gay London or striking Onllwyn. Some London gay men from mining regions are shown grumbling that their hometowns are too homophobic to merit support, while others implore LGSM to instead address the AIDS crisis. Gay’s the Word owner Gethin doesn’t oppose LGSM, but he stays in London rather than join the comrades on their trips to his native Wales. A noticeable exception is the portrayal of lesbians, who seem selfish and divisive when they break from LGSM to form Lesbians Against Pit Closure. With so little indication of the real-life political conflict between the male Trotskyists and other Communists at the heart of LGSM’s leadership, it’s impossible to see that forming LAPC was a fair reaction to infighting, and was part of a national movement of Women Against Pit Closures to promote women’s leadership on the Left. Pride also shows dissension in the union ranks over accepting money from gays and lesbians and, through a gay miner, reinforces the notion that divisions between gays and the working class cannot be easily drawn. Despite the film’s overall fidelity to the historical events, by implicitly positioning gays and lesbians as benefactors who come to the miners’ aid from relative stability, the filmmakers soften lived reality for gays and lesbians in London in 1984. In truth, the gay community was under attack from police brutality, social stigma, and a growing AIDS crisis. Looking outside their own community was not only a brave act of solidarity, but a hopeful intention to build mutual power. Ashton died in 1986 at the age of twenty-six from complications due to AIDS, never seeing the prescience of his words or the lasting impact of his solidarity campaign. When the mining strike ended in victory for Margaret Thatcher, her government indeed turned to the gay and lesbian community, passing the infamously homophobic Section 28 legislation in 1988 against the protest of a coalition that included the National Union of Mineworkers. Like the seam of coal connecting Wales to Pennsylvania, US labor and LGBT history is peppered with lesser-known examples of labor-LGBT collaboration. In her path-breaking book on the subject, Out in the Union , historian Miriam Frank documents the solidarity “gaycott” of Coors products in the late 1970s, and the importance of union opposition in defeating the Briggs Amendment in California in 1978. Analogies to the British labor situation can be overdrawn, but these examples and others point to an alternative road for LGBT politics in the United States, one that takes up the mantle of Lesbians and Gays Support the Miners. Kate Redburn is a contributing editor at Jacobin and a PhD student in history at Yale University.